It's time to put your craftsmanship to work. ModDB have joined forces with the Starpoint Gemini Warlords team @StarpointGemini to give you the chance to win cash and ROCCAT hardware by creating an addon for Starpoint Gemini Warlords. What you make is really up to you, but think BIG as any warlord would! The event runs until Jan 12th 2017, during which time community votes will determine the top 10. Once the top 10 is finalized the staff of ModDB, Iceberg & LGM will be judging the entries & present the winners shortly. Goodluck! The challenge is to create a mod for Starpoint Gemini Warlords. You can enter the main competition with over $5000 in prizes by creating and sharing a Spaceship or Spacestation (which we are told takes a pro about 3 ~ 4 days). 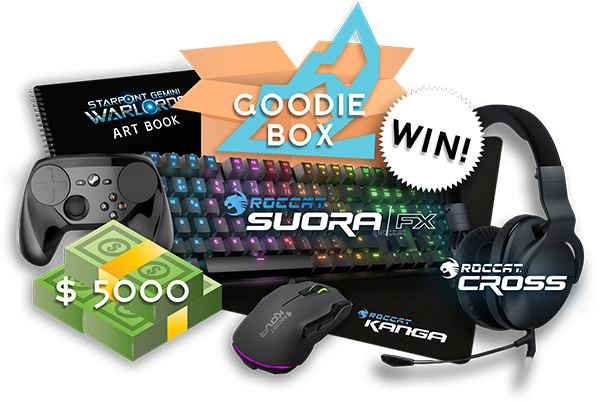 Or you can enter the secondary competition with over $2500 in prizes by creating and sharing any other addon like a 2D portrait, bridge voice, SFX, music or decal (which can be done in 1 ~ 2 days). We've got tutorials to help (see roundup) get you started. You can share your mods anywhere, here or on workshop and enter an unlimited number of times. BUT because community voting on ModDB decides the top 10, we highly recommend you submit to ModDB as soon as possible and promote your creation to generate the votes necessary to win. Everyone from the community who votes for and downloads the mods entered, automatically goes into the draw to win digital game keys from Iceberg Interactive. And remember, the competition closes Jan 12th 2017, so get your entries in before then and please read the rules below or get in touch if you have questions. custom decal pack seven simple emblems created as vectors and converted to dds. anvilship anvil battleship mod for starpoint gemini warlords modding contest. kirb's portrait pack a small 3-pack of custom portraits for player usage, two under the male category (though they're both actually genderless), one female. christmas chaos, some technical matters, and general life meant this came out a lot smaller than i wanted - hoping to come back to it later down the line, and with a bit more experience with digital art under my belt. sculpture is my main discipline, so i'm pretty happy to take a stab at expanding my range a bit. made chiefly in autodesk sketchbook, with some touching-up done in pse. spgw music spgw music pack containing four original tracks: ambient (exploration) and battle tracks. criget the frigate this mod adds a new frigate ship to the game called the criget. it's available for purchase at the concordia station. molo dimolo 2 different tracks. one for the battle, another one for the space ambient. i am game and media composer, let me know your thoughts. thanks! exemplar_mesh for tutorial an example ship for starpoint gemini warlords, complete with .fbx, .obj and textures. this is meant to be used with the ship creation tutorial. No mods were found matching the criteria specified. Working on something? Add it to join the Starpoint Gemini Warlords Modding Contest. Your entry MUST be tagged with #competition or #SPGW or uploaded to the Starpoint Gemini Warlords addon section. Your entry MUST work with the most recent version of Starpoint Gemini Warlords. Your entry MUST be your own work, using models or art created by other people is not allowed without their explicit permission. All content allowed including fan inspired, but we shall adhere to any DMCA takedown requests and will remove content if requested by the copyright holder. You are allowed to participate with as many entries as you wish (they will be judged individually). Any submissions received after the Jan 12, 2017 18:00:00 -0500 deadline will be disqualified. Community voting runs from Nov 17, 2016 18:00:00 -0500 to Jan 12, 2017 18:00:00 -0500 and is solely used to determine the top 10 from the available eligible entries. Every community vote enters that member in a draw to win a maximum of 1 digital game from Iceberg Interactive. If we (ModDB) suspect vote manipulation we maintain the rights to disqualify entries. Judges from ModDB, Iceberg Interactive and Little Green Men Games will pick the Top 3 winners in both categories from the community voted Top 10. Winners in both categories will be announced on ModDB before Jan 19, 2017 18:00:00 -0500. Winners must be able to supply us with their email, home address & shipping location within a week of finishing the contest, to be eligible to receive their prize. Any tax, customs, duties or other fees will be the responsibilty of the competition participant. ModDB reserves the right to disqualify any entry at their discretion for any reason from the competition. By participating, entrant agrees to release and hold harmless sponsors and their respective parent companies, affiliates, service agencies, subsidiaries, independent contractors, and the officers, directors, employees, investors, agents, and representatives of any of the above organizations from any injury, loss, or damage to person, including death or property, due in-whole or in-part, directly or indirectly, to the acceptance from or use/misuse of a prize or participation in any promotion-related activity.